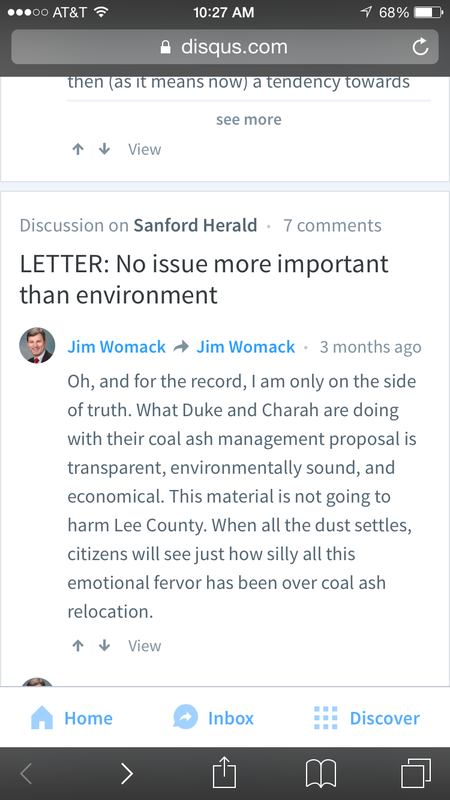 Observers of the coal ash debate in Lee County may have noticed something interesting in recent days as former Lee County Commissioner Jim Womack appears to have lined up alongside environmental activists fighting Duke Energy’s plans to dump 8 million tons of the waste material at a site in Lee County. 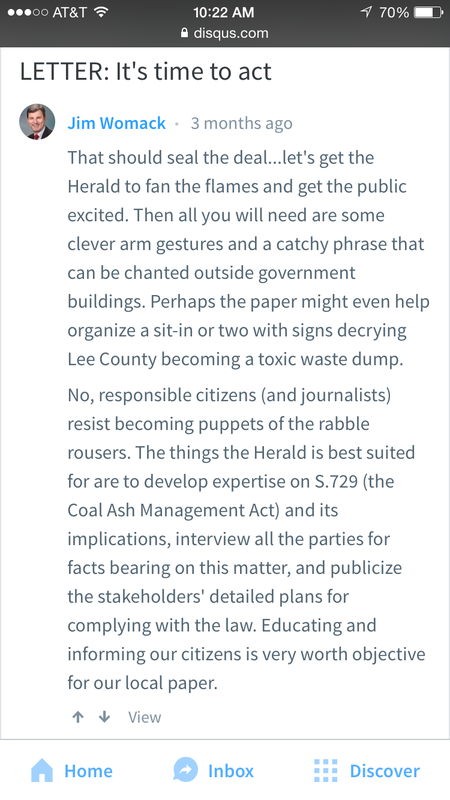 Despite this comment, and the fact the Herald bizarrely gave Womack a platform to advise environmentalists on a course of action in Thursday’s edition (subscription required), Womack has a lengthy history – in the same space – of not only supporting the coal ash dump, but also of criticizing both opponents of the plan and the Herald itself. 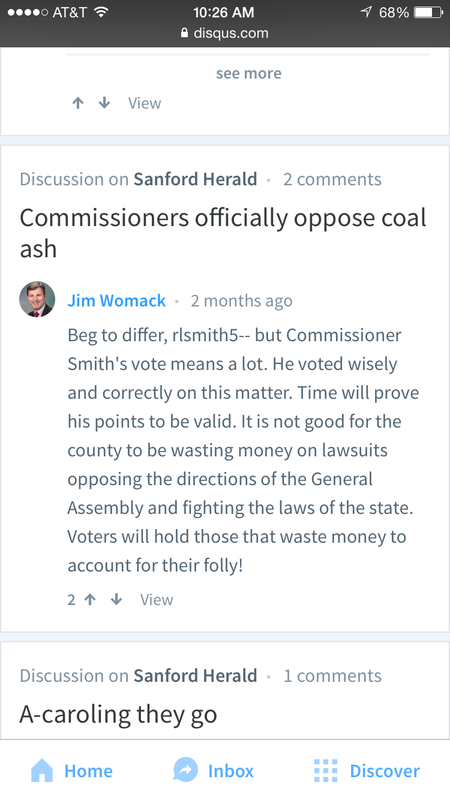 Womack also opined that Republican Commissioner Kirk Smith’s vote against a county resolution opposing the coal ash deal (subscription required) was consequential. “Time will prove his points to be valid. 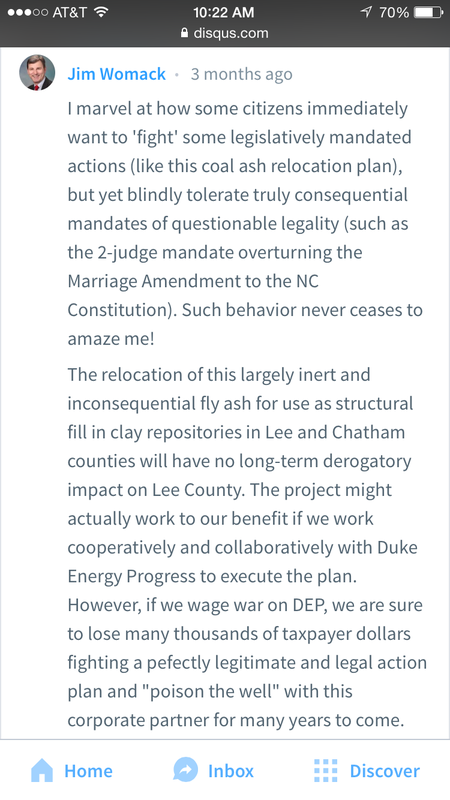 It is not good for the county to be wasting money on lawsuits opposing the directions of the General Assembly and fighting the laws of the state,” he wrote. And let’s not forget this. The focus by this blog on Womack may seem strange given his recent exit from public office, but readers should know he’s elected to stay in the arena of local politics, having been recently named first vice chair of the Lee County Republican Party. 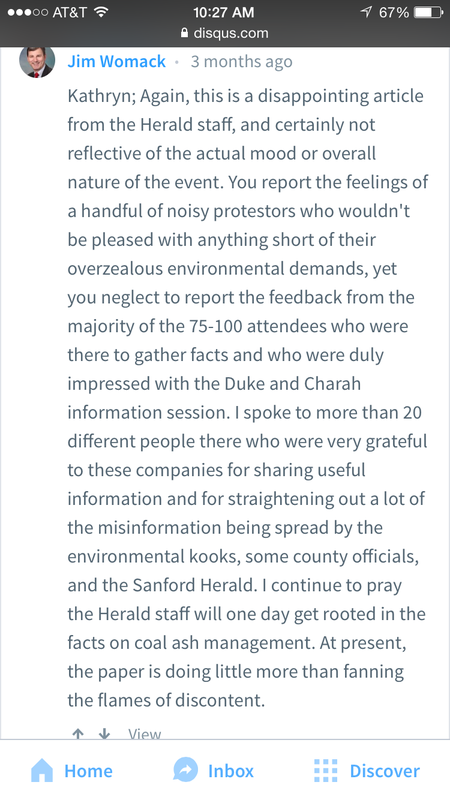 And if the Herald wishes to continue adding his voice to this debate, it should at least examine past statements by him which are available on its own website. Doing so might lead one to wonder if Womack is simply “concern trolling” as a method of damaging the credibility of those he disagrees with. 30to3in4coal ashdukeJim Womackspacely space sprockets inc.
Womack….taking out of both sides of his mouth!!!!! Womack is a flaming Jackass and a real enemy of Lee county.